[S185] Property Titles. ; PROV (Public Records Office Victoria), C/T 3667-395 - Jessie Agnes Bowser of 15 Edward Street Sandringham Spinster - C/T 5796-173. [S185] Property Titles. ; PROV (Public Records Office Victoria), C/T 3667-396 - Jessie Agnes Bowser of St Georges Road Upper Beaconsfield Spinster - C/T 5827-343. [S185] Property Titles. ; PROV (Public Records Office Victoria), C/T 5543-431 - Jessie Agnes Bowser of St Georges Road Upper Beaconsfield Spinster. [S134] Electoral Roll for Australia, 1934.
bh5/2582 Bowser Jessie Agnes 1957,. Death-Notice* 25 Jun 1935 BLAIKIE -On the 24th June (suddenly) at her residence, 13 Hampden road, Armadale, Annie, dearly beloved wife of Robert Blaikie, loved mother of Annie, Jack, Jean, Daisy, Charles and Roberta -A life made beautiful by kindly deeds. [S2] Registry of Births Deaths and Marriages Federation Index Victoria 1889-1901 "#M1044." [S11] Newspaper - Argus 25 Jun 1935, p1. [S125] Electoral Roll for Australia, 1925. [S128] Electoral Roll for Australia, 1928. Mollie PAINE died Minnie Beatrice PAINE nee PATTEN. Marriege 1921 to William Gordon PAINE." 21 Jan 1932, One of the worst bush fires in the memory of the oldest residents occurred here on Friday and Saturday, when a devastating fire swept over the district. On Friday, a fire, which had been burning in the scrub, fanned by a strong north wind, menaced the residence of Mr. McMillan, and in response to a call for help, about 50 men were soon engaged in a fierce fight to save the house and outbuildings. This they managed to do, and the fire then jumped the main road and threatened the residence of the Misses McLean; a break was burned, and the house was safe. On Saturday morning another fire commenced near Miss McLean’s boundary fence, and soon the residences of Messrs. Blair, Boker and Gilpin, and a number of others were in danger. A large band of willing workers managed to save the houses, but unfortunately they could not save the fine lemon orchard of Mr. McMillan, which was destroyed, also a week-end residence of Mr. Harkins. The heat was so great when the place got alight that it was im possible to get near it. In the after noon a sudden change of wind to the south caused the township to be menaced, and a desperate call for help was sent out, and in reply volunteers from Berwick, Narre Warren and Dandenong came to augment the local Bush Fire Brigade, until there were over 200 men, under the direction of Constable Barrett, and other leaders, engaged in the desperate effort to save the homes of Madame Montigue, Messrs. McBride, McDonald, Harvey-Smith, Rev. T. Greenwood, Robinson, J. Campbell, Major Campbell, Miss Elliott, J. Deville, C. Ellis, Claydon, Wright, Binding and Brown. The worst fight was at “Kyogle,” Mr. McDonald’s house; at one time it was felt that this fine residence would go, but the determined fight put up by the willing workers saved it. Here it was that anxiety was felt for one band who had become surrounded by flames, but they managed to get clear, although some of them succumbed to heat and smoke after getting out. The fine garden and plantation of Major Campbell was swept by the fire, despite the efforts of the workers, and hundreds of pounds worth of valuable plants and trees were destroyed, and the fine house was only saved by the superhuman efforts of the fire fighters. Miss Elliott’s house got alight, and part of the roof had to be stripped off before the fire could be put out. Mr. Ellis had the fence and pavilion attached to his tennis court destroyed, and the fire swept through his orchard, only being stopped within a few feet of the house. The house of Mr. Wright was saved by burning a break, as was Mr. Brown’s house and lemon orchard. 10 Feb 1936, TOWN MENACED BY FIRE. TWO HUNDRED FIGHT FLAMES. BEACONSFIELD UPPER OUTBREAK. BEACONSFIELD UPPER Sunday - A bush fire menaced the township of Beaconsfield yesterday, but 200 fighters checked the spread of the flames and a heavy downpour of rain virtually extinguished the fire which was the most serious one. In the district this summer. Had it not been for the good work of the bush fire brigade assisted by volunteers, considerable loss of property might have occurred. The fire began on Friday in the gully below Mr McMillan's house on the main road from Beaconsfield to Beaconsfield Upper. A south east wind carried the fire up a gully to the back of the properties of Messrs Wright and Binding. It was checked there by beaters but crossed the road and damaged the orchard of Mr Walter Brown. The wind dropped in the evening and it was considered that the danger had passed. [S61] Upper Beaconsfield History Archive ,"Julie Jamieson & Audrey Ridgway." [S80] Ancestry - Family Tree, Wills Family Tree - Owner: wi59655. [S65] Ancestry - various indices, Ancestry.com. UK, Outward Passenger Lists, 1890-1960 [database on-line]. Provo, UT, USA: Ancestry.com Operations, Inc., 2012. [S185] Property Titles. ; PROV (Public Records Office Victoria), C/T 4111-089 John Binding of Upper Beaconsfield, farmer. [S185] Property Titles. ; PROV (Public Records Office Victoria), C/T 4111-089 - Edward Myers Clerk and Evaline Lottie Myers his wife both of McArthurs Road Upper Beaconsfield - joint proprietors. [S127] Electoral Roll for Australia, 1927. [S136] Electoral Roll for Australia, 1936. [S158] Electoral Roll for Australia, 1958. [S163] Electoral Roll for Australia, 1963. [S167] Electoral Roll for Australia, 1967. Binding John 1973 96 hus/ Mary Elizabeth, our father bw0740. [S218] Newspaper - The Dandenong Journal (1927-1954) "21 Jan 1932, p4." [S11] Newspaper - Argus 10 Feb 1936, p3. [S185] Property Titles. ; PROV (Public Records Office Victoria), C/T 3886-191 - see C/T 4065-868 Mary Elizabeth Binding of Upper Beaconsfield Married Woman. [S185] Property Titles. ; PROV (Public Records Office Victoria), C/T 4065-868 Rosetta Newton Colls Blackwood of Stawell Street Mentone Married Woman. She died on 5th Oct 1961 Probate granted to John Finlay Anderson of 472 Bourke Street Melbourne Solicitor. [S83] Online index to the UK census "Class: RG12; Piece: 1596; Folio 5; Page 4; GSU roll: 6096706." [S83] Online index to the UK census "Class: RG13; Piece: 107; Folio: 85; Page: 57." [S218] Newspaper - The Dandenong Journal (1927-1954) "22 May 1940, p12." [S3] Registry of Births Deaths and Marriages Edwardian Index Victoria 1902-1913 "#B1334." [S25] School Records - Beaconsfield North 2560. [S149] Electoral Roll for Australia, 1949 "to Trafalgar 1949." [S177] Electoral Roll for Australia, 1977. [S3] Registry of Births Deaths and Marriages Edwardian Index Victoria 1902-1913 "#B18974." [S6] Registry of Births Deaths and Marriages Marriage Index Victoria 1921-1942 "#M97." [S22] Victorian Government. BDM Index Victoria (online) "place of birth Upper Beaconsfield." [S135] Electoral Roll for Australia, 1935. [S172] Electoral Roll for Australia, 1972. [S177] Electoral Roll for Australia, 1977 "Frederick William & Gwendoline in Hampton Park mechanic." [S35] Probate Records, PROV (Public Records Office Victoria), VPRS 28/P4, unit 1943; VPRS 7591/P3, unit 289. [S5] Registry of Births Deaths and Marriages Death Index Victoria 1921-1985 "#D14425 age 86 [par Richard Edward BULLEN & Unknown ATTWOOD]." [S185] Property Titles. ; PROV (Public Records Office Victoria), C/T 1717-373 - Richard Edward Bullen of Charles Street Jolimont Farmer. [S185] Property Titles. ; PROV (Public Records Office Victoria), C/T 1717-373 - C/T 8159-113 - Albert Edward Holland Wellington Road Narre Warren East Pensioner. [S185] Property Titles. ; PROV (Public Records Office Victoria), C/T 1717-373 - Richard Edward Bullen died on 2 Nov 1957. Letters of Administration with the will annexed of his estate have been granted to National Trustees Executors and Agency Company of Australasia Limited of 95 Queen Street Melbourne. [S185] Property Titles. ; PROV (Public Records Office Victoria), C/T 1717-373 - C/T 8317-116 (consolidated with transfer Transfer A140578) Albert Edward Holland of Wellington Road Narre Warren East Pensioner. [S185] Property Titles. ; PROV (Public Records Office Victoria), C/T 1717-373 - C/T 8357-821 - John Francis Liddamore of Edward Street Berwick Clerk. Death-Notice* 12 Feb 1935 BURTON. On the 11th February at Beaconsfield Upper, Harry George, beloved husband of Isabella and loving father of Harry. (Mentioned) Village Bell Jun 1994 The article reads: HEARSAY HISTORY - PART TWO Our neighbour Harry Lang, of “Woodland”, now 21 Walnut Grove, told us that there was once a stand of walnut trees on the Telegraph Road side of the property. He recalled a Mr. Buckland, a timber getter who took out the big trees on our place. He occupied a very small hut on a shelf cut on the hillside, with a waterhole close by, on our “Wattle Paddock”. His horse team dragged long logs along one side of the Sailor's Gully, crossed it near the top end, and down the other side to Telegraph Road, where they were loaded on jinkers for transport. Traces remain of his tracks, his flowers, and big logs that he felled but could not take out. 19 Jun 1919, McMULLEN.- the 17th June, at the residence of her son-in-law, Mr H G Burton, "Cormore," Finch street, East Malvern, Jane, relict of the late John McMullen, late of Keysborough, and loving mother of Julia (deceased), Rachael, Sarah, Isabella, and David (deceased), aged 80 years. [S65] Ancestry - various indices, Library and Museum of Freemasonry; London, England; Freemasonry Membership Registers; Description: Membership Registers: Colonial and Foreign O 2645-2869 to Colonial and Foreign P 2871-3083; Reel Number: 30. [S14] Newspaper - The Australasian, 3 Dec 1904, p59. [S65] Ancestry - various indices, The National Archives of the UK; Kew, Surrey, England; General Register Office: Miscellaneous Foreign Marriage Returns; Class: RG 34; Piece: 4. [S11] Newspaper - Argus 12 Feb 1935, p1. [S15] Newspaper - Village Bell "Issue 98 - Jun 1994, p15 by John Milligan." [S131] Electoral Roll for Australia, 1931 "Harry Alex' address as 'Crail' Officer Road, Upper Beaconsfield." 4-690-A Burton F 10/12/1951 1287. [S11] Newspaper - Argus 19 Jun 1919, p 1. Death-Notice* 10 Dec 1951 BURTON.—On December 7 at a private hospital, Murumbeena, Isabella Burton formerly of Beaconsfield the dearly loved wife of the late Harry George Burton and loving mother of Harry (1 Looker street Murrumbeena) and loved Cooe of Harry and Dora. BURTON.—The Funeral of the late Mrs ISABELLA BURTON formerly of Beaconsfield will leave the home of her son Mr Harry Burton, 1 Looker street, Murrumbeena, THIS DAY, after a service to commence at 9.55 a.m. for the Berwick Cemetery, arriving about 10.45 a.m.
13 Jul 1925, TUESDAY, JULY 14. At Twelve O'Clock. At the Rooms of FORRESTER and Co., 15 Queen Street. UPPER BEACONSFIELD. - Cormore, Gembrook Road and Halford Street. - MODERN W B STORE, AND BILLIARD ROOM; DWELLING, 4 large Rooms and SO., Every Convienience, Stables, Buggy-shed ; All in Good Order; Small Orchard. LAND, 100 x 250. The Owner (Mrs Burton) Has Built up a Good Business, and Will Sell Stock and Fittings at Valuation. death entry = born Keysborough." [S185] Property Titles. ; PROV (Public Records Office Victoria), C/T 3639-719 - Isabella Burton of Beaconsfield Upper Married Woman - C/T 4702-300. [S185] Property Titles. ; PROV (Public Records Office Victoria), C/T 4702-300 - Mortgage No 467202 - discharged 1 Aug 1925. [S185] Property Titles. ; PROV (Public Records Office Victoria), C/T 4702-300 - Mortgage No 471366 - discharged 1 Aug 1925. [S185] Property Titles. ; PROV (Public Records Office Victoria), C/T 4702-300 - Robert Allan of Springvale Gentleman. [S11] Newspaper - Argus 10 Dec 1951, p16. [S18] Newspaper - Pakenham Gazette "18 May 1917, p2." [S11] Newspaper - Argus The Argus (Melbourne, Vic. : 1848 - 1957), Tue 12 Dec 1922, p12. [S11] Newspaper - Argus 13 Jul 1925, p2. Military* 18 May 1936 Enlisted for military service: Caulfield, VIC, Australia, Australian Army - SERN 3905054 (VP3717, VX15759). Death-Notice* 9 May 1990 BURTON, Harry A. (Lt. Col.) Passed away suddenly. May 3. 1990. The sudden death of Lt. Col. Harry Burton at his country home “Melbournia”, in a’Beckett Road was the finale to an association and love of Upper Beaconsfield which commenced more than 70 years ago. When Harry’s father was demobilised in 1919, he purchased land in Upper Beaconsfield, and Harry was sent to the State School. After six months it was decided to move him to the School at ‘Casely’, in Salisbury Road where the Rev. James Wilson taught a small number of pupils. When this school closed in 1924, Harry returned to the State School for a further year. In 1926 there was very little work available in Upper Beaconsfield, due to the decline in the apple market, and the weekend visitor numbers were dropping. Harry chose to move to Melbourne where he worked at Ball & Welch, a department store, as a warehouse lad. In 1932 the store opened a self-serve shop in competition with Coles, and Harry was moved to this store where he eventually managed a floor. Whilst there he also met a very nice cashier, Miss Bertha Hankinson of Campbellfield, whom he married. The new store was not a success. Harry decided against continuing work at the main store and returned to the village where he faced many problems. In 1923 his father had sub-contracted the building of “Cormore”, (now the Milk Bar) which in those days functioned as tearooms and also had a billiard room. All was well until 1927, when the decline in visitors forced him out of business. Later he became a local estate agent. In 1928 he had a severe stroke, which forced him to retire. Harry accepted the responsibility of supporting his parents, whilst he was in the City but found it very difficult on his return home. He would undertake any work he could find, including cutting wood for eight shillings a cord, ploughing at ten shillings an acre, or making apple cases for three pence each. He also had a one acre plot where he grew vegetables for sale. Another venture was to purchase cattle in Dandenong, drove them to Upper Beaconsfield, and graze them in bushland. Eventually he established regular work, and was able to buy some real estate. One of his jobs was the care of the property “Glenleith” owned by a dentist, Mr. John Ballantyne, later to be bought by Melbourne Grammar School, who renamed it “Melbournia”. Harry purchased the property from the School after the war, and spent many happy days there. Although his main home was in Melbourne, he was often to be seen riding around his property at weekends. In 1934 he tendered for the Mail Contract at a rate of two pounds per week. The mail had always been delivered on horseback since Bert Wain first started it in 1923. Harry decided to modernise deliveries, and purchased a Harley-Davidson motorbike for the job. Unfortunately corrugated roads and difficult terrain were too much for the bike. In 1928 Harry was called up for Compulsory Military Training and finding the life to his liking, joined the permanent Army in the mid 30’s on the advice of General Foott. He went to North Africa and served in Greece and Crete where he was taken prisoner of war, a predicament from which he escaped after several attempts. Harry later retired from the Army as Lieutenant Colonel. Harry had a great love for the village, and spent a lot of time usually at weekends here. He continued to ride until recent times. His clear recall of the past made him an excellent raconteur and he was often of help with local history. 11 Feb 1950, THURSDAY, FEBRUARY 23. At 3 p.m. In Our Rooms. FIRST FLOOR, ORIENT LINE BLDG., 352 COLLINS STREET. REALISING AUCTION SALE of "MELBURNIA," UPPER BEACONSFIELD. VACANT POSSESSION. Formerly Known as "Gowan Bray." Approx. 40 Acres of Land, with Extensive Improvements, Situate About 3/4 Mile from Township. A Commodious Timber Building, with Wide Verandahs on Four Sides and Containing Large Diningroom and Kitchen, Storerooms, 6 Extra Rooms, and 2 Bathrooms. Equipped with E.L., Hot Water and Septic Tank Services, and Telephone. Other Improvements Comprise a Timber and Fibro Recreation Hall Lined with-Coneite, Concrete Tank Approx 12,500 Galls. Capacity. Underground Tank, 3000 Galls Cap. Approx Laundry, with Cement Troughs and Copper; Fibro Fowlpens with Concrete Floor, Wirenetted. Sufficient for 1000 Birds: Tennis-court (Wired), Water in Gully. Purchaser to Have Option of Buying All Equipment at Valuation. [S61] Upper Beaconsfield History Archive ,"Interview by Charles Wilson with former pupils of Rev Wilson." [S3] Registry of Births Deaths and Marriages Edwardian Index Victoria 1902-1913 "#B2674." [S11] Newspaper - Argus 17 Jan 1911, p1. [S6] Registry of Births Deaths and Marriages Marriage Index Victoria 1921-1942 "#M8435." [S185] Property Titles. ; PROV (Public Records Office Victoria), C/T 2113-556 - Harry Alexander Burton of Upper Beaconsfield Farmer - C/T 6877-381. [S185] Property Titles. ; PROV (Public Records Office Victoria), C/T 6877-381 - Edgar John Donaldson of Brisbane Street Berwick Hotel Manager. [S185] Property Titles. ; PROV (Public Records Office Victoria), C/T 6457-291 + C/T 3535-953 - Harry Alexander Burton Soldier and Bertha Alice Burton Home Duties of 1 Looker Avenue Murrumbeena - joint proprietors. [S185] Property Titles. ; PROV (Public Records Office Victoria), info on land title. [S101] Electoral Roll for Australia, 1903 - 1980 "Mollie's name before her marriage may have been REEVE. 4 Abbott Street, Balwayn North in 1980. Maiden name probably Armstrong. 1943 electoral roll WA." [S5] Registry of Births Deaths and Marriages Death Index Victoria 1921-1985 "#D15847 age 73 [par Halm HANKINSON & Violett Alice]." [S185] Property Titles. ; PROV (Public Records Office Victoria), C/T 6457-291 + C/T 3535-953 - Harry Alexander Burton of 1251 Toorak Road Burwood Retired Army Officer is now the survivng proprietor. [S18] Newspaper - Pakenham Gazette "Pakenham Gazette, 9 May 1990." [S15] Newspaper - Village Bell "Issue 74, Jun 1990, p13, by Charles Wilson." [S185] Property Titles. ; PROV (Public Records Office Victoria), C/T 6457-291 - Harry Alexander Burton died on 3/5/90. Probate of his will has been granted to Mollie Rowena Burton of 4 Abbott St North Balwyn Harry Roy Burton of 1 Mary St Hobart Tasmania & Dorothea Brenda Hollingdale of 1249 Toorak Road Burwood. 4-081-B Burton Harry Alexander M 79 8/05/1990 2140. [S11] Newspaper - Argus 17 Aug 1940, p4. [S11] Newspaper - Argus 11 Feb 1950, p16. 16 Jul 1980, BURTON, Bertha Alice. - On 14 July, beloved wife of Harry Alexander, dearly loved mother of Harry and Dora, mother-in-law of Anne and John, adored grandma of Jane, harry, Hugh, Zoe, Miranda, Eve, Hector, Rex and Brenda. She gave her love to all. 17 Jul 1980, BURTON, Bertha Alice. - Ever devoted mother and darling of Dora (Mrs Hollingdale). Each a tower of strength unto the other through their goodness and loving kindness. BURTON, B. A. 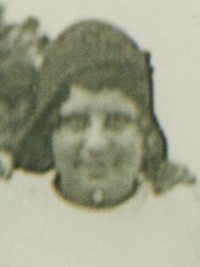 - On 14/7/80, highly esteemed and ever helpful mother-in-law and friend to John Hollingdale. We praise God for her manifold kindnesses and her life. [S15] Newspaper - Village Bell "013-1980, p11." [S137] Electoral Roll for Australia, 1937 "with Edward Mitford HANKINSON, fitter, Violet Annette HANKINSON, home duties, & Karina Violet HANKINSON, clerk." [S16] Newspaper - The Age 16 Jul 1980, p27. [S16] Newspaper - The Age 17 Jul 1980, p23. Death-Notice* 12 May 1937 BROWN. — On the 11th May, at 29 Hopetoun street, Elsternwick, Jean, eldest daughter of the late Charles and Ann Brown, late of Ballarat, sister-in-law of Robert Blaikie, loving aunt of Dollie, Jack, Jean, Davis, Charles, Bobbie Blaikie, aged 79 years. — Sweet rest. BROWN -The Friends of the late Miss JEAN BROWN are respectfully requested to follow her remains to the Fawkner Crematorium. [S22] Victorian Government. BDM Index Victoria (online) "Place of birth BALLARAT." [S11] Newspaper - Argus 12 May 1937, p1.